"Yesterday's guilty verdicts won't change much. The world splits between those who see Lord Black as the embodiment of capitalist evil, and those like [a] rich friend [of mine] who will continue to see him as the victim of an American show trial." Is it really quite so neat? The standard insinuation of those who defend the bighead rich is that we who despise them do so out of envy. Nuts to that. 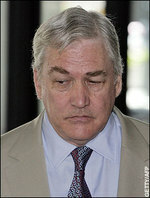 I don't despise Conrad Black because he had a ton of money, a haughty wife and a piece of Napoleon's porcelain. I despise him because he behaved as if people like him are simply not required to obey the same rules as the rest of us and dismissed those who dared to contradict him as worthless. "There exists a mile-wide streak of self-righteousness in the man, a glut of self-confidence that transcends run-of-the-mill arrogance," his first biographer once wrote. It is that arrogance that has brought about his downfall. Serve him right. The thing that caught my eye in Fletcher's piece was this. "Certainly, those of us who had grimped their way far enough up the Telegraph ladder to get invited to those wonderful parties the prosecution made such play of, never imagined Black was paying for them himself. But then journalists are very credulous when it comes to proprietors. We like them rich and we like them bullying, and we never take the trouble to find out if they own the whole thing or - like Black - a big whack of the shares." Which implies that being an uncurious toad-eater is the way to get ahead in journalism. I think that a few Telegraph grunts (who never 'grimped' their way into one of Black's parties) may take a different view of matters. I noticed that passage too. I'm afraid Fletcher's generalisation about what journalists like in proprietors is false (and one reason why some of us prefer working for The Guardian). By contrast, your generalisation about the way to get ahead in journalism is far more sustainable.